How to print a document that has a background color or image that won't print or show up in Print Preview. This process also works in Word 2013 & 2010. Step 1:In Word, click the File tab, then Options. 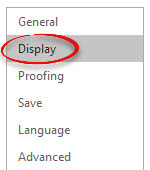 Step 2:In the Options window, click the Display menu. Step 3:Put a check next to Print background colors and images. Click OK.